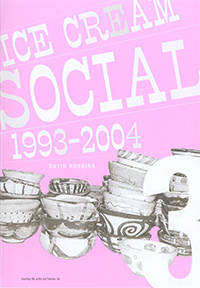 Conceptual artist David Robbins began his series of “Ice Cream Socials” in 1993. Since then, Robbins's Ice Cream Social has evolved to include live performance, visual artwork, a novella, a television show and a feature movie script. Robbins says, "An ice cream social is an occasion for members of a community (however that community `chooses to define itself) to temporarily put aside their labor, gathering, enjoy confectionery refreshments, relax with friends, and perhaps initiate new friendships. My Ice Cream Socials do all this while adding a layer of something else-something self-reflective, consciously thematic, and metaphorical". The Miller Gallery exhibition will feature a version of Ice Cream Social along with documentation of past projects. Work courtesy of the artist and Feature, Inc.